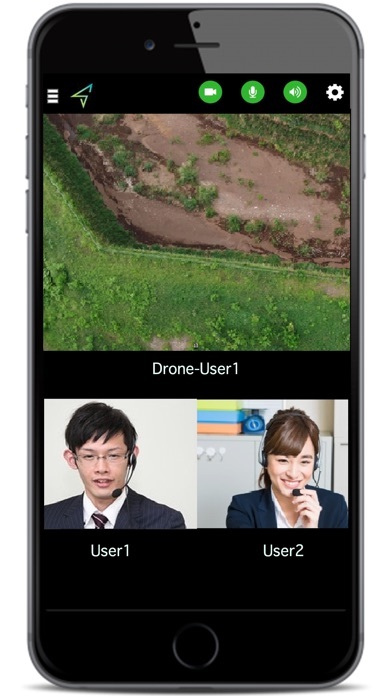 A service that allows you to communicate by sharing in real time and in multiple locations images taken remotely by drones. 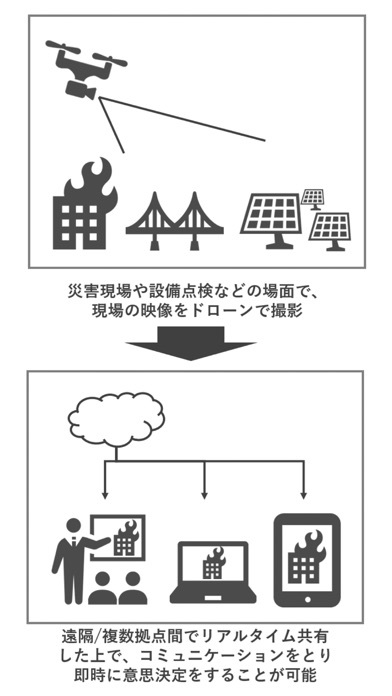 This solution makes it possible to immediately grasp situations and make decisions when disaster strikes or during facility inspection without going to the site since the situation at sites can be seen in real time. It is possible to immediately find out the extend of damages and take proper measures when natural disasters strike by sending drones into disaster areas and sharing real time images captured by the drones with the task force and relevant authorities. Making use of this solution in maintaining and inspecting a wide range of social infrastructures, such as power lines and bridges, allows skilled experts who are responsible for maintaining and inspecting these infrastructures to remotely perform efficient and safe facility inspection and to grasp the situation at the sites through images captured by drones, which eliminates the necessity of travelling to remote places. Altro da SENSYN ROBOTICS, Inc.